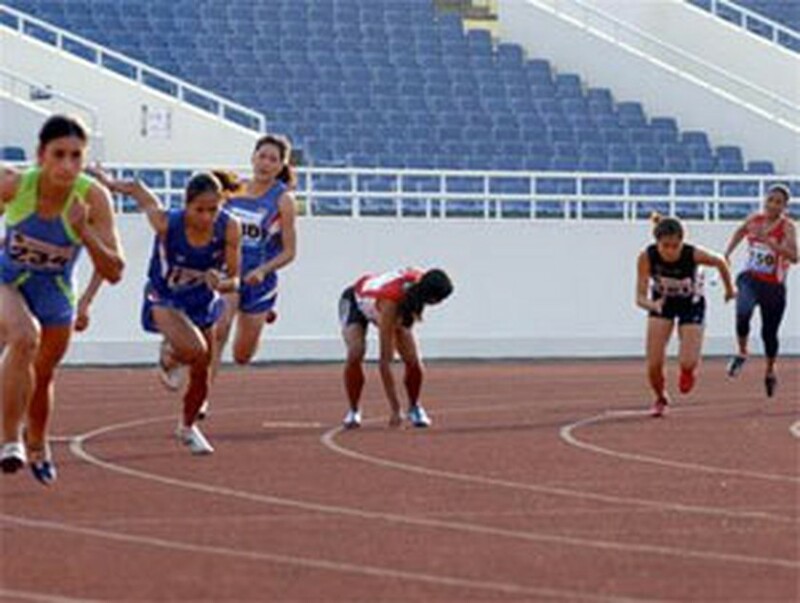 Southeast Asian students compete at a track event. Vietnamese track-and-field athletes increased their edge over the competition at the 13th Southeast Asian Student Sports Festival by picking up three golds, four silvers and three bronzes yesterday. Hoang Thanh Viet won a gold medal in the men’s 200-meter event while Le Ngoc Phuong and Nguyen Thi My Duyen picked up a silver and bronze respectively in the women’s 200. In the men’s 5,000-meter race, Nguyen Van Toan finished first, capturing the gold, while his countryman, Nguyen Dang Duc Bao, finished second with a silver. In the women’s 100-meter hurdle, Nguyen Thi Thanh Hoa won silver while Cao Thi Hang got a bronze. In the women’s javelin event, silver and bronze medals were awarded to Danh Thi My Duyen and Nguyen Thi Be Thi respectively. Le Thi Phuong achieved a gold in the women’s pole-vault competition. In badminton, Indonesia retained the number one position at the games as both their men’s and women’s teams inflicted crushing defeats against both the Thai men’s team (3-0) and the Vietnamese women’s team (3-1). Vietnamese Pencak Silat competitor Nguyen Anh Viet picked up a silver in the men’s Tungnggal category. In the women’s event Thi Hue beat Thailand’s Suvannee 5-0 in the singles F category allowing her to move on to the next round. Le Ngoc Anh defeated Yuphaphon (Thailand) 5-0 in the women’s single A category and Dinh Cong Son won 4-1 over Ridwan (Malaysia) in the men’s single F category. In Basketball, Viet Nam’s women’s team beat Singapore 73-68. In Taekwondo, Doan Minh Dang defeated Malaysian rival Silvarajah 5-3 in the men’s 54 kilogram class. Dinh Thanh Long battered Singapore rival Lim Choom Hon 7-0 in the men’s 58 kilograms category and Dao Ngoc Ly won 2-1 over Flora Sinti (Malaysia) in the women’s 47 kilogram group. In tennis, all of Viet Nam’s hopefuls were stopped at the semi final round by Indonesia.